What is a Steam Gift? How can I purchase Steam Gifts for a different Steam user? How can I deliver the gift at a later date? What happens after I purchase a gift? How will I know whether my friend has received their gift? How do I activate a Steam gift that I received? Do gifts expire if they are not redeemed in a certain amount of time? How can I tell someone else how to give me a gift on Steam? 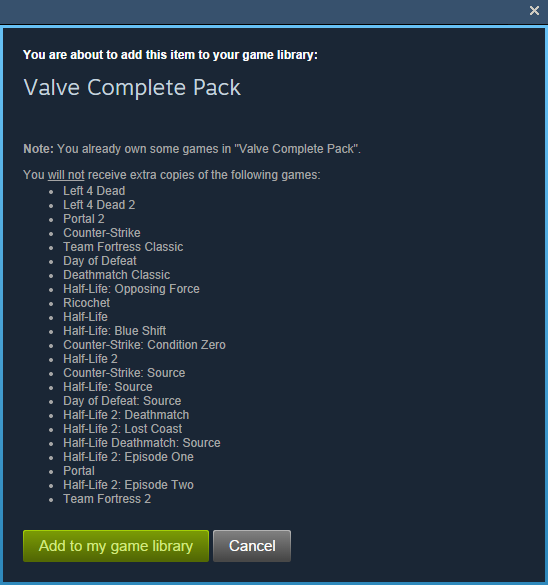 What will my friends see if I send them a Steam gift? Can I send gifts to Steam users in other regions? A gift I have received is region restricted. What do I do? Can I gift game packs? How can I tell if my friend already owns the game(s) I would like to gift? Can I give multiple gifts at the same time? Can I gift games I no longer play to my friends? Why was my gift revoked? May I sell gift subscriptions? How do I share the Four Pack for [L4D, L4D2, Borderlands] with three friends? How do I view my gift history? Can I refund my gift? 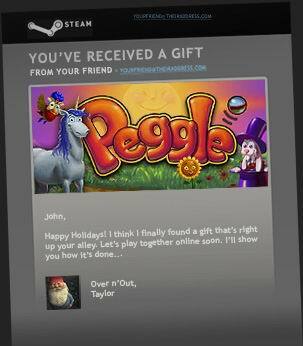 When you purchase a game on Steam, we offer the option to “gift” the item to anyone on your Steam friends list. The recipient will receive the gift as an attractive e-mail card with a personal message from you and instructions to redeem the game. A Steam gift purchase is a one-time transfer—after the recipient has redeemed and installed the gift, it is now a part of his or her Steam games collection. Also note that you may only gift new purchases—you may not transfer games you already own. That’d be like wrapping up and presenting the toaster you’ve used every morning for the past year. To give a gift to a friend or family member, locate the game you would like to gift on the Steam Storefront and then click the "Add to cart" button. Upon checking out, select the "Purchase as a gift" option to purchase the items in your cart for a friend. When you select the "Purchase as a gift", you'll be presented with a list of your Steam friends, from there you can select who you'd like to receive your gift. If you'd like to send it to someone who's not listed, you'll have to add them to your Steam friends list. This helps ensure your gift is going to make it to the right person. After you've chosen a friend to receive the gift, you can click the "Schedule delivery..." button to schedule the gift to be sent automatically on a future date. When that time comes, we'll automatically send the gift to your friend and also send you an email letting you know your gift has been delivered. You may take a few moments to add a special message to the gift recipient. When they receive your gift, your special message will be displayed for them in Steam and they will also receive your gift message via e-mail. Steam currently accepts the following payment methods. Once your purchase is complete, please print your receipt for your records and store the hard copy in a safe place. You will also receive an e-mail receipt verifying your purchase. Your friend will receive an e-mail message, including your personalized gift message, notifying them that they have received a gift. 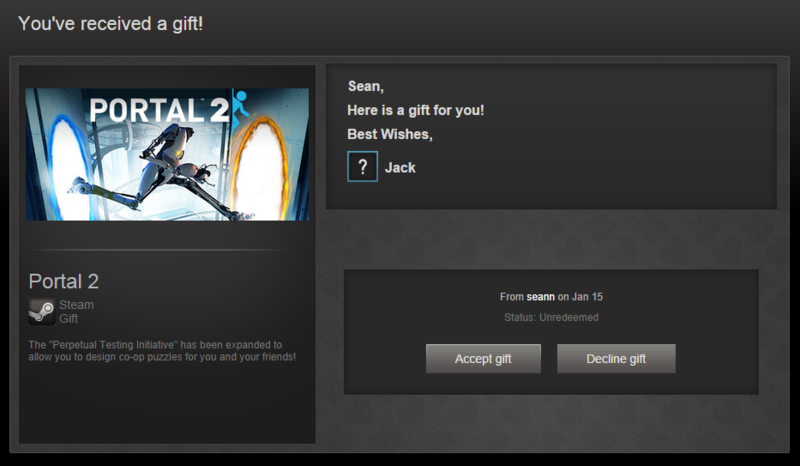 Your friend will also receive a gift notification in the Steam client. You can check the status of all your gifts on your Steam Inventory page. You can also access this from the Steam client - Within Steam, click on "Games" in the main menu, then select "Manage gifts and guest passes...". When your gift is sent to your friend, they'll have the option to accept or decline the gift. Once they do, we'll send you an email letting you know. If your friend takes no action on the gift, we'll automatically cancel the gift and issue you a refund after 30 days. How do activate a Steam gift that I received? 2. Clicking on "1 new gift" will take you to the following screen where you must click either Accept Gift or Decline Gift. Once you click Accept Gift, the game will be added directly to your Library. If you click on Decline Gift, we'll issue a refund to the original sender. You can optionally include a note when you choose to decline the gift; whether you do or not, we'll email the sender to let them know the gift was declined. 3. 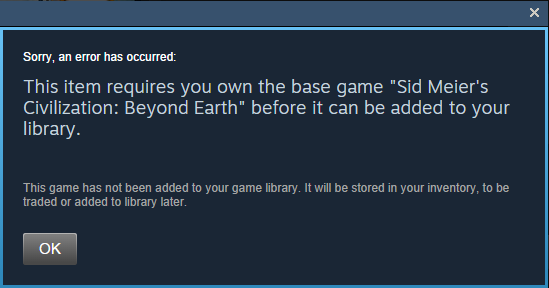 When you add the game to your Library it will be listed in your Library > Games list in Steam, highlighting the game and clicking the "Install" will download the game to your computer. If the game is already in your Library you will receive a notification that it is and you will not be able to add it. After a gift has been delivered to a friend, they have thirty days to accept the gift. Once the gift has been accepted, the game is permanently subscribed to the Steam account that it was redeemed on. To give a gift on Steam, simply create a Steam account online and then purchase your gift from the Steam store. For more information about purchasing games on Steam, please see this guide. Do not allow someone else to use your Steam account to make a gift purchase. When you send a gift to your friend, they will receive an email and a notification at the top of their Steam client that they have received a new gift. Territory restrictions are noted on the Steam Store page. Steam Support cannot make changes to territory or language restrictions. Yes, you can gift game packs the same way you would gift an individual game. Four packs of games cannot be gifted. If your friends are members of your Steam Friends list, you can learn whether they already own the game you'd like to give. Your Steam Friends who already own this game will automatically be filtered out of the potential list of recipients. You can also visit your friend's Steam Community profile and click the link to "View all games" to view your Friend's list of owned games on Steam before purchasing them a gift. You can give as many gifts as you'd like at one time, but only to one friend per transaction. You cannot gift games that were previously purchased on your Steam account to friends. Steam Gift Purchases cannot be sold. Attempting to sell a gift subscription is a violation of the Steam Subscriber Agreement and may result in your account being permanently disabled. To do this, simply purchase the Four Pack on Steam, and then refer to this guide to share your Extra Copies using the Steam client. A refund may be issued for any gift that was purchased within fourteen days and has been played less than two hours by the gift recipient. More information on how to refund gifts can be found here.